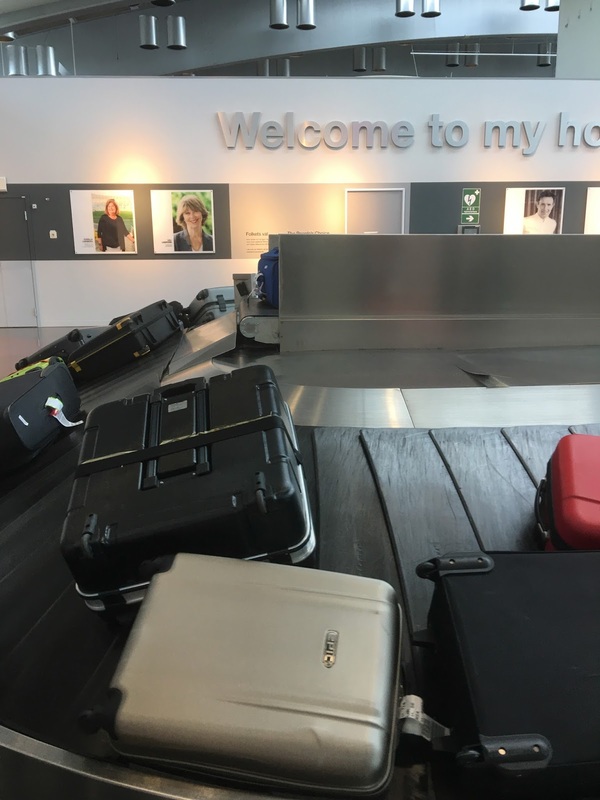 So, you are flying with your Brompton - and wondering just how to transport it? If you are taking your Brompton on holiday with you by plane - then you want it to be happy and functional when you arrive, otherwise you may as well have just opted for a local hire bike - but you probably want your own trusted steed and to show it off to the world (or just test it's capabilities). We took one of each on a short holiday to test them out out. The tried and trusted B&W Brompton box (or small folding bike) is tough like a camera case and has dimensions of a x b x c and weighs in at xxkg. It's a tried and tested box and been around for a few years. To get the bike into the box, the saddle had to be right down (the Brompton had a standard height seat post - for an extended one the saddle may have had to be removed) and the MKS removable pedals removed. 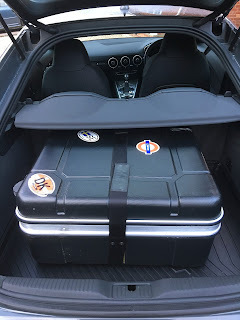 It was a bit of a struggle to get the bike in the box - bit it fitted OK in the end and the fact it was snug meant that it wouldn't rattle around and get damaged. We also packed some clothes to act as padding! 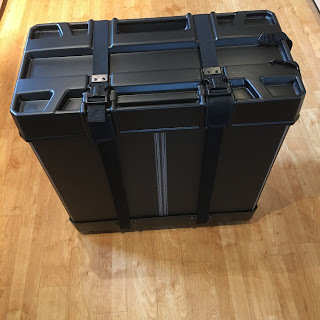 The B& W Brompton bike box has two catches at the top which can be locked (we lost the key and don't lock it anyway so security can take a look inside if they want to) and a velcro wrap around strap which holds it securely closed. 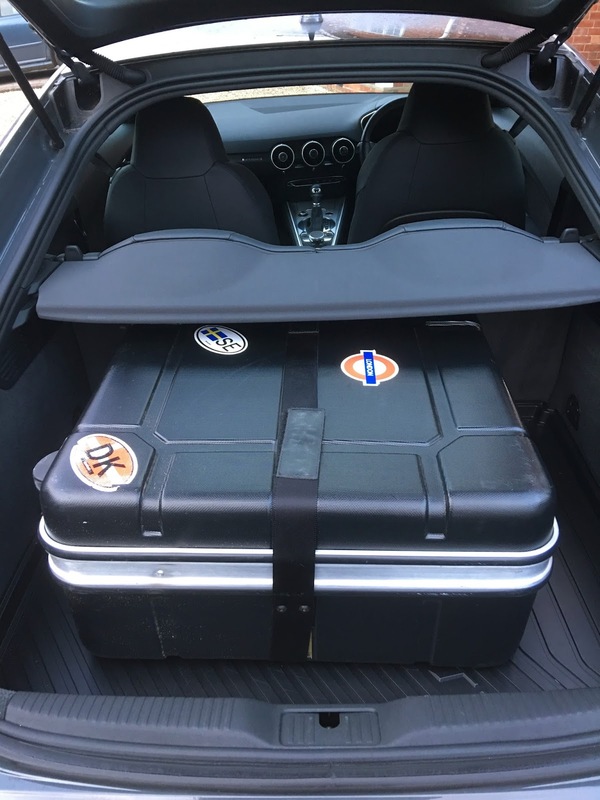 It was transported to the airport in a suitably small car - and fit in the back with out having to put the back seat down. We waited with bated breath at the other end (not actually knowing if the box would appear on the luggage carousel or at the oversize luggage counter!) 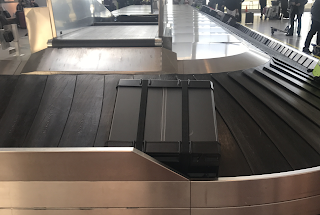 - it appeared with all the other luggage with a loud clunk as the converyor belt spat it out. 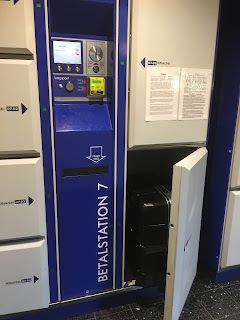 Left luggage locker - the box didn't fit! 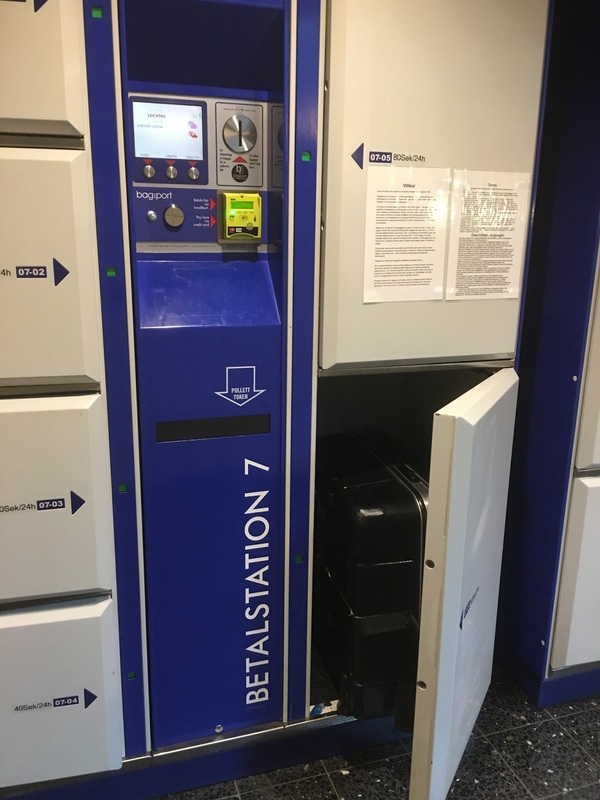 Finding a left luggage locker was relatively easy, but I made the mistake of taking the bike out before seeing if the box would fit. The bike arrived safe and sound and was well behaved for 5 days of cycling! However - on the return trip the Brompton suffered from a broken titanium front mudguard stay and a broken roller wheel. The Foldon box was introduced by B&W in 2017 and folds up by using tough plastic which means it takes less space when being stored. It has slightly larger dimensions of 67cm long x 34cm wide x 70cm high when unfolded and resting on the wheels, but just a 67cm long x 34cm wide x 22cm high when folded for storage and weighs in at 6.1kg when empty. It comes nicely folded with a strap holding it folded - remember to take this with you. The box is like Zebedee - it likes to spring open! 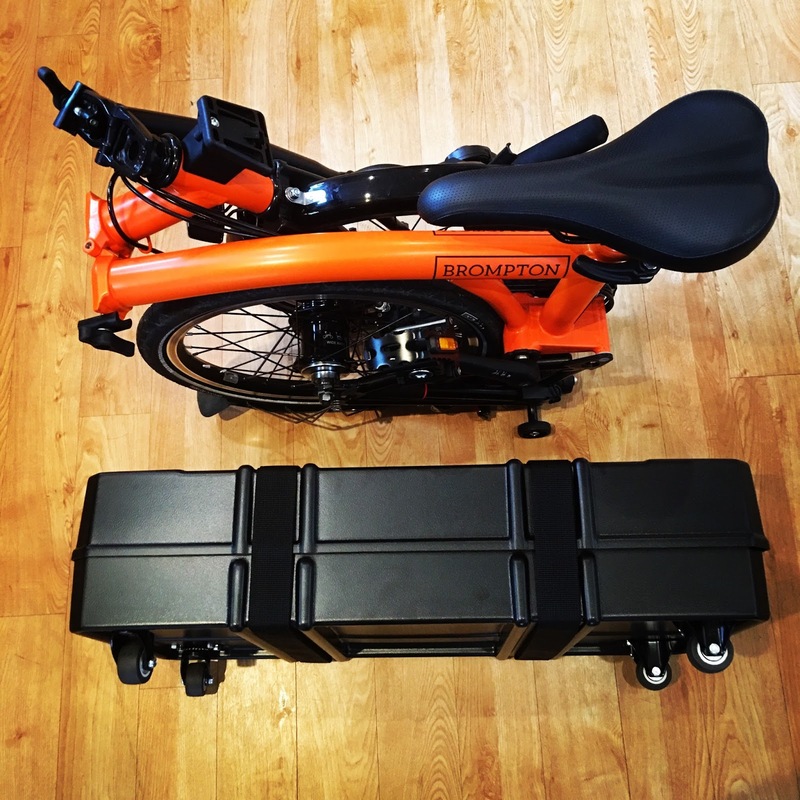 The picture also shows the folded Foldon box next to a Brompton for size comparison. So first the box top and bottom come off and there are hard plastic inserts (to make the walls), which are held together with aluminium and plastic strips. The plastic wall (now one piece sits in the base and the Brompton is lowered into position. As you can see from the picture, it has plenty of space around the bike - so we padded it out with bubble wrap. When the box arrived - there appeared to be no exterior damage. The baggage tag had to be attached to these straps - the only doubt we had was that if the strap came undone, the tag would be lost - though this hasn't happened yet. First - they both do the job, and both Bromptons ended up at their destination in the condition we hoped for! 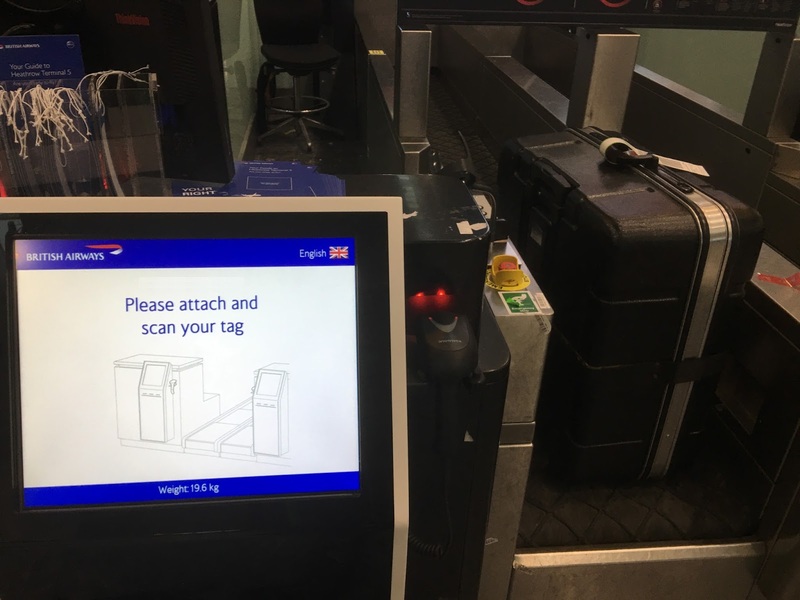 Travellers Top Tip: We were told (on a subsequent trip) by BA staff (several) and by a camera crew we bumped into at the oversize luggage conveyor belt that bikes / boxes are treated better on oversize luggage than when checked in as normal items. It is lighter and folds up to a smaller size for storage. 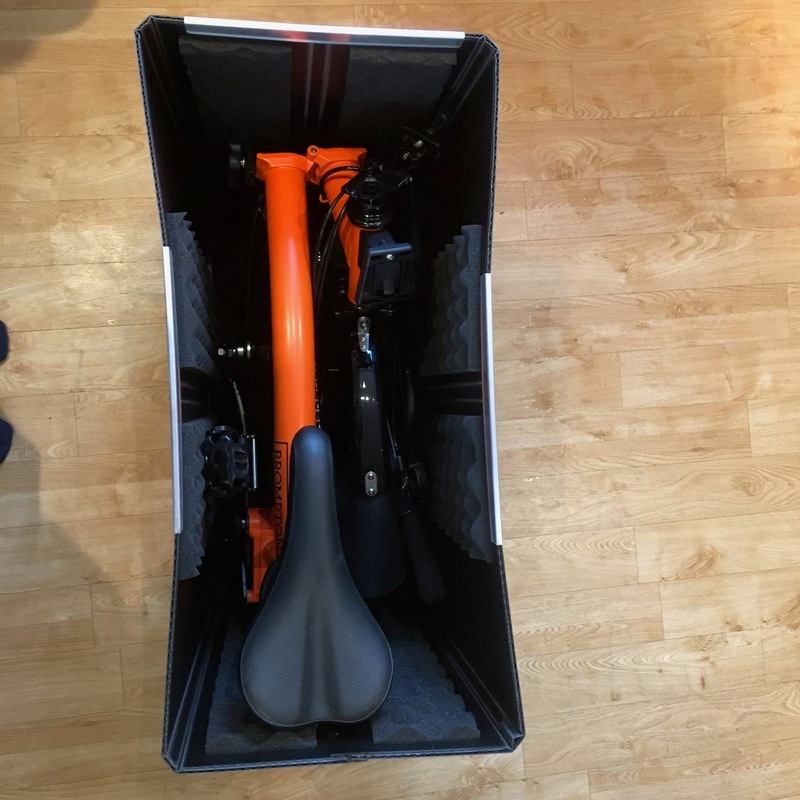 The Foldon box has more space inside - so is easier to get the Brompton inside, and the pedals didn't have to be removed - though we did have to pack this out with bubble wrap to shop it shifting around too much which we think could lead to bike damage. 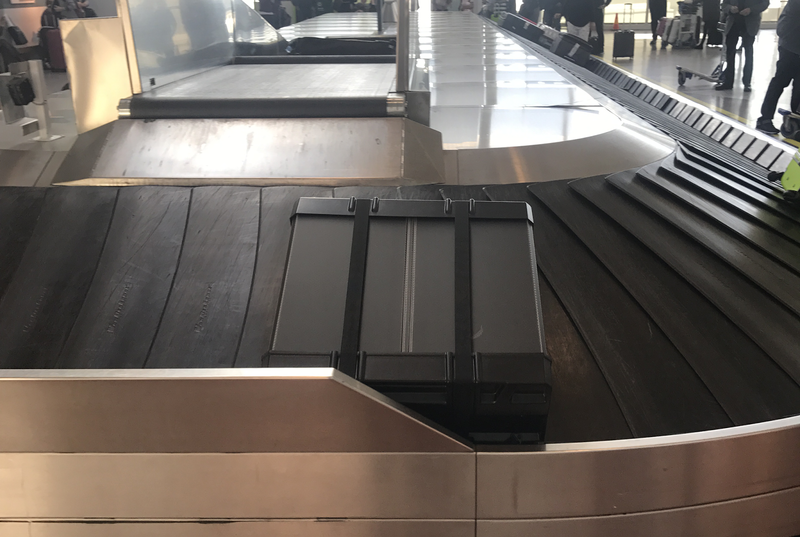 Compared to the B&W Brompton box, the Foldon is easier to roll around the airport - as it has 4 wheels and a strap for pulling rather than the pair of wheels and telescopic handle on the box. When storing at the other end, the ability of the Foldon to be "smaller" could save money!